On Thursday, July 19, Wayne Estopinal didn’t know what kind of response he would receive when he stood in front of a crowd in Jeffersonville to display his firm’s latest concepts for Big Four Station, a park surrounding the northern approach to the Big Four Pedestrian Bridge over the Ohio River. “I came here ready for a battle,” Estopinal said. “In reality, people really liked it. It was really well received.” Estopinal is principal at The Estopinal Group, an architectural firm with offices in Louisville and Southern Indiana who designed the latest component of the Big Four project with Taylor Siefker Williams Design Group. Big Four Station forms a gateway where the HNTB-designed northern ramp of the Big Four Bridge descends along the original path of the bridge’s approach, turns to the east, and meets the ground at Chestnut and Pearl streets. 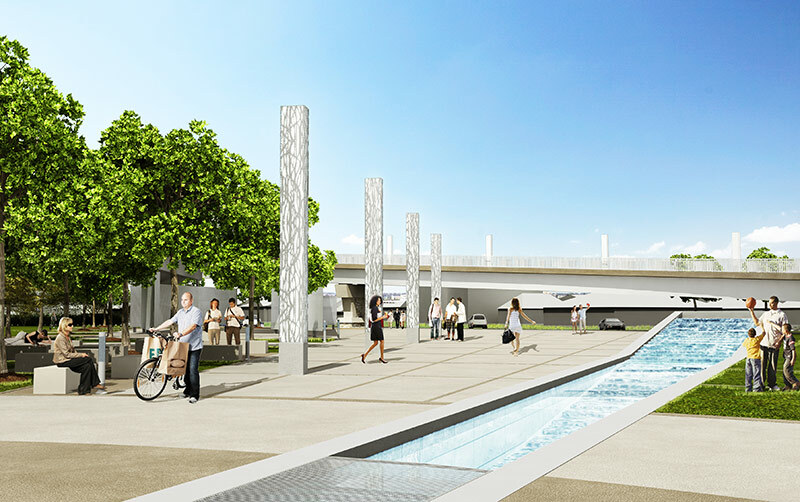 The current conceptual design includes four signature elements: a monumental obelisk at the base of the ramp, four sculptural light columns surrounding a water feature, and an open air pavilion. 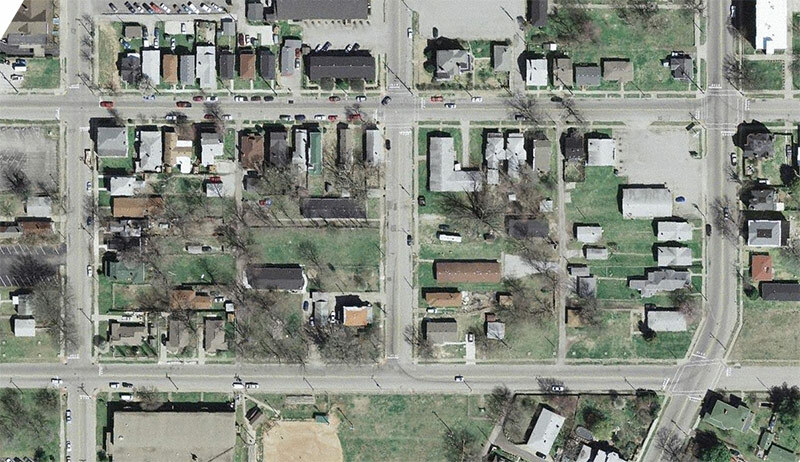 The park’s layout radiates from the obelisk, forming a series of smaller spaces throughout the two-block-long green space—one block of Chestnut Street will be removed during the project. While the obelisk’s design is likely to change, Estopinal said the monument will convey some sense of permanence with an iconic presence. Surrounding the obelisk and radiating west through a large plaza, a cascading water feature inspired by the Falls of the Ohio appears like an exclamation point at Big Four Station. Four 25-foot-tall, internally-lit light towers covered in a layered metal filigree and art glass move through the center of the plaza and form a visual reference when approaching the Big Four ramp. Anchoring the plaza, a large open-air pavilion blends traditional and modern design to create a multipurpose space that can house events like farmers markets and gallery displays. A pitched roof with an internal barrel vault hovers over a series of perforated metal walls. Estopinal said these walls help to obscure the pavilions structural supports, provide an easy way to hang objects, and offer additional security since visitors can see if someone is on the other side. Other design elements include a bike rental station and restroom pavilion, a children’s play area covered in a tensile fabric canopy, and 140,000 cubic feet of water retention, mostly provided underground, to capture stormwater before it overwhelms the local sewers. Two corner parcels have also been marked for future development, capitalizing on the adjacency to downtown, the bridge, and the park. 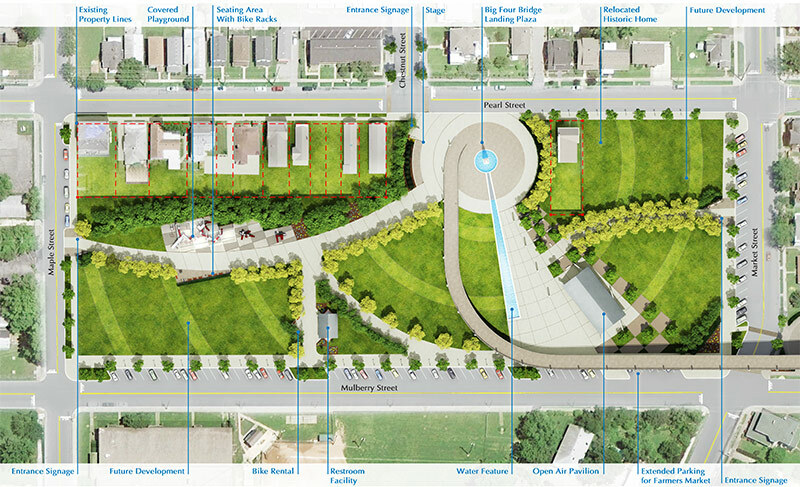 Estopinal said the scale of each new structure responds to the surrounding neighborhood. The public meeting generated a couple hundred comments, which The Estopinal Group is studying to update the park’s design, which is expected to be complete by September 1. Another public meeting will be held before that time. Funding for the $3 to 4 million Big Four Station is already in place from a bond issue and construction could begin in Spring of 2013 with an opening date of Spring 2014. While the park’s details are worked out, construction continues on the Big Four Bridge itself. Crews have been installing a new 20-foot-wide concrete deck on the 1895-era span, which should be complete by December. The southern approach ramp has been complete for some time, dramatically soaring 70 feet over Waterfront Park and offering a spiraling backdrop for events like Waterfront Wednesday. When decking is complete on the bridge, it will be opened to the public, although the northern ramp ramp in Jeffersonville won’t be complete until several months later. Once complete, the entire Big Four Bridge will span about a mile. The bridge itself spans 2,525 feet and the ramps on each side add another half mile. So once the novelty wears off, how many people will actually use the bridge on a daily basis? I can see joggers and cyclists. Then skateboarders will run the pedestrians off. Then the vandals move in and make gang art. Who will patrol the bridge…at night?